Mercedes customers order matte paint, which costs between 4,200 euros and 5,400 euros, on as much as 3 percent of SL roadsters, above, and CLS coupes, according to the automaker. (Bloomberg) -- When U.S. actress Lindsay Lohan stepped out of a black Rolls-Royce Phantom last year, her car wasn't bearing the traditional hand-buffed shine. Lohan's choice of a matte-finished vehicle from Bayerische Motoren Werke AG's ultra-luxury brand underscored an emerging trend in the luxury auto industry. Dull paint jobs will feature at the Paris auto show this week as never before, with image-conscious drivers seeking to rise above the glossy masses. Daimler AG's Mercedes-Benz brand will show six matte cars including the 187,425 euro ($255,000) gull- wing SLS in cashmere white, while BMW will present a 69,400 euro M3 sedan in frozen gray. Matte cars, which stand out on city streets by deflecting the glow of animated billboards and flashing neon, have a long-standing association with speed. BMW's aluminum-clad 328 sports car, which won the Mille Miglia race in 1940, was unpolished to reduce glare for the driver. While matte cars have been growing in numbers by applying vinyl foils over the finish, dull paints are a new phenomenon on modern cars because they are technically more complex than standard high-gloss paints and can be difficult to repair. They're also pricey, with Volkswagen AG's Lamborghini charging as much as 20,000 euros for a matte finish. The cost hasn't deterred wealthy buyers seeking exclusivity. Lamborghini sells 10 percent of the Murcielago and as much as 3 percent of the Gallardo model with matte finishes, spokesman Raffaello Porro said. Its dull paint jobs start at 10,000 euros and come in black, brown, white and yellow. Luxury-car sales are rebounding from the financial crisis, when wealthy consumers held back on flashy purchases. Driven by a recovery in the United States and growth in China, BMW and Mercedes are each targeting 10 percent sales gains this year. VW's Audi brand forecasts record sales in 2010, while Rolls-Royce expects to double sales on demand for the less-conspicuous Ghost, which came to market late last year. Flat finishes fit this shift to more understated luxury. “The consumption is there but it's not quite as loud and obnoxious,” said Rebecca Lindland, an analyst with IHS Automotive based in Lexington, Massachusetts. Mercedes customers order matte paint, which costs between 4,200 euros and 5,400 euros, on as much as 3 percent of SL roadsters and CLS coupes, spokeswoman Verena Mueller said. 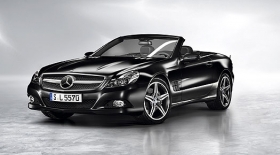 Mercedes' matte paint program started in 2004 with a limited series of the CLK convertible designed by Giorgio Armani. Other special editions followed in 2005 and 2009. The SLS, introduced earlier this year, was the first to offer dull colors as a standard option. The automaker offers matte finishes on other models through its customization program. The world's second-largest luxury-car maker expects growing demand for matte paints and plans to offer flat colors on all its model lines in the future, Wagener said. Still, matte car buyers risk getting sucked into a fad, which could backfire if trends change. “It's a brave choice, when you're spending that amount of money,” said Colin Couchman, a London-based IHS analyst. BMW began offering “frozen” gray and black on the M3 this year, as an option that costs about 3,000 euros. The world's largest maker of luxury cars introduced a special version of the Z4 roadster in April to commemorate the 1940 victory in the Mille Miglia. The Z4 edition, available only in Italy, simulates a matte paint with a foil, a technique used to dim glare. Lohan, the 24-year-old actress who went to jail for a brief period earlier this month after failing a court-ordered drug test, wasn't available to comment, according to her publicist. Audi, which aims to overtake BMW in luxury-car sales by 2015, will offer its first-ever flat finish with the R8 GT sports car in early 2011, spokesman Eric Felber said. Customers will be able to order the R8 GT, a special edition limited to 333 vehicles, in matte gray at a price of 193,000 euros. The flat finish adds 4,300 euros to the cost. Not all manufacturers of high-performance cars are fans of flat colors. Porsche SE, the maker of the 911 sports car, doesn't offer dull finishes because of concerns about the paint's durability. “The quality of matte finishes available does not yet satisfy the standards we have at Porsche,” spokesman Hermann- Josef Stappen said, explaining that flat paints haven't been fully developed yet and can be damaged by car-wash brushes. The dull look also isn't for everybody. That's just fine for drivers like Vettel, who finished second last weekend at the Singapore Grand Prix, looking for a car with distinction.